I am a longtime LR user and only recently bought a GoPro. When it dawned on me that there might be profiles to correct the distortion, I was excited. After playing with it, I’ve decided it’s not worth turning on Lens Profile Corrections as a default for my GoPro images. In many cases, for instance see the lower of the two original/corrected images in your post, fixing the horizon only creates scale errors in the horizontal, the building on the right looks wider than it is in real life. Do that to a person, and she’ll be very annoyed, and so probably will you be too. It’s easier for the mind to live with the curved horizon than the unnatural look of people or other objects. For certain images, such as panoramas composed of many many images so the overlap is large and you’re only using the center of the field for unique content, then the profiles will certainly help. Yeah, I agree that I wouldn’t turn it on by default. I think it’s great for dramatic effect, and specific corrections (and panoramas, as you mentioned), but there is some distortion, so use it wisely. You can achieve similar results without the edge distortion using the Adaptive Wide Angle filters, but I’ve found it to be far more manual of a process. However, if you want to straighten things out without the distortion, its far worth the manual effort. 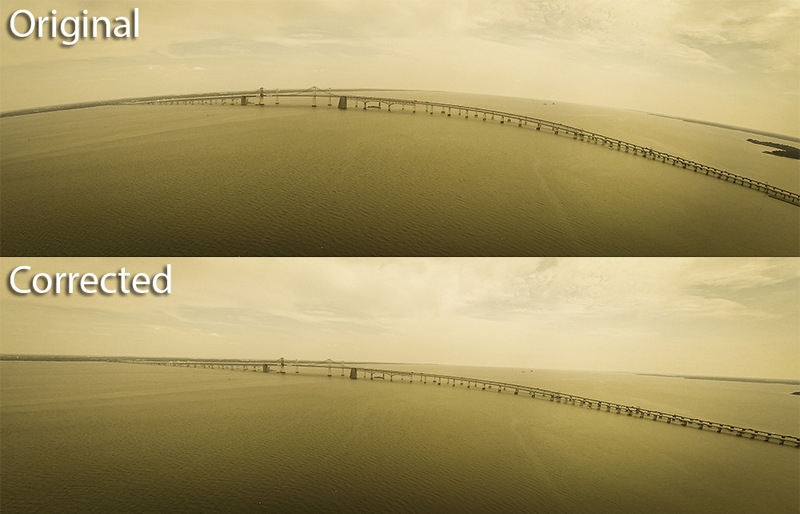 I just did a post showing the difference in Adaptive Wide angle and Lens Profile Correction wtih images from GoPro cameras… check it out here: http://www.tricedesigns.com/2013/08/09/two-ways-to-remove-fisheye-from-gopro-images/ The Adaptive Wide Angle filter approach has a little less distortion, but is more labor intensive. I’ve been using GoPro cameras for a bit and have been trying to remove/reduce the fish eye effect in my videos. I’ve seen your video (and others) on using the lens filter in Ps6. As you can see in the screen shot below, I cant get the GoPro camera option to show up in the drop down menu. I’ve installed all of the updates to no avail. I’m sure there is something I’m not doing correctly. Any help is greatly appreciated. Did you download the update from Adobe Labs (link above)? This is a beta/release candidate feature, and is not in a “normal” update yet. You’re the man! Works great now. I guess I thought it was a Ps6 update and not a ACR update (since I don’t use ACR much). This is so much easier than “Adaptive Wide Angle”. Thanks for the assistance. You can go back to being a hero again! Excellent tutorial. Thank you. Do I understand correctly that you use Photoshop (which version ?) rather than ALR for correcting videos ? I use ALR, Adobe Photoshop Elements, and Adobe Premiere Elements but cannot find the video functions there. Please excuse me if this is a silly question but I use my GoPro to study the physiology of marine mammals… I have to calibrate my images to the camera and my computer so I know the size of the animals that I am shooting, Now if I used this method, would it change the image so much as to not be able to calibrate and record the size of the animals? I honestly don’t know the answer to this one. It does stretch the outter area of the image. However, since everything is being stretched uniformly, it might be OK. Do you have some kind of visual reference point inside of the image for comparison? I think the best thing is to just try it and see how the measurements differ (if at all). That is true I will have to compare a few images with each other. Thanks for your help! A curvilinear lens as the one used on GoPro is the worst possible choice for measuring objects filmed. Even after the artificial compensation for the fish-eye effect the picture is basically useless unless you work with large margins of error. The “correction” introduces another error known as forced perspective. Basically you force something which the lens was looking at from the side (because of the fish-eye lens in the GoPro) into the perspective og the picture elements the lens was looking straight at. You want to look up the difference between curvilinear and rectilinear projection – even the wiki is quite precise. I am looking to do some GoPro work covering golf courses. With little-to-no knowledge on GoPro devices, what is the best camera to go with the combination of affordability, quality and simplicity for a relative beginner who will be looking to learn more about video work? Also, something that will effectively capture a golf course. I’d like to know if there’s a lens profile for the GoPro Hero 2? I didn’t find one but had pretty good luck using the Hero 3 White profile with 120 on the distorsion scale. Obviously you have to manually select this profile since it doesn’t fit with the camera’s metadata. I can’t seem to figure out how to download the update for camera raw, so that i am able to select the GoPro option. Please help me!